There is a limitless option of tourist activity in Raja Ampat Regency. Apart from exploring the beaches and hills, tourists can learn about the locals’ life. For example, it is in Mutus Island. People who live in such island mostly work as a fisherman. That means tourists are able to witness those people’s activity, including fishing and riding a boat. This kind of attraction also becomes photographers’ point of interest. It is because every moment is worth a photo shoot. Not to mention tourists have an opportunity to eat some seafood like grilled fish, crab soup, and much more! What tourists can see in Mutus Island is a combination of a coastal area, lush trees, and a local settlement. No wonder, it emits a unique ambiance with a serene atmosphere. In the beach, there is a traditional pier, but it doesn’t come with a good condition. Some holes are seen on such wooden pier, so people need to pay attention to their steps when getting on it. In the horizon, some local boats are seen and become a unique background at dawn. Travelers have recognized Mutus Island as a stunning vacation spot, as it offers a fantastic beauty. Still, the island is also famous for its nautical richness, especially fishes. This explains why villagers mostly work as a fisherman. For tourists, such fishing activity and the boats become a distinct attraction, which they can’t find in other regions of Raja Ampat Regency. Learning the local’s way of living is worth lots of experiences, after all. Not to mention tourists have the chance to ride the boat along with those fishermen. The thing is Mutus Island becomes the part of Kabui Cape. That means tourists can also explore other islets near to that area. Lots of coral reefs are also seen, appearing majestically. With a proper speedboat, tourists can explore all parts of the cape. Overall, Mutus is not the only location to spend a holiday there. For an alternative photography background, there is Pencil Island. Despite the inaccessibility, the island is quite popular among tourists. Don’t forget to carry a camera! At the end of the exploration, it is time to get back to Mutus Island. Some villagers may offer delicious foods, especially grilled Belanak Fish. It has a savory taste and soft-textured meat. For those who want to get a new experience, it is even possible to fish in the pier. No wonder, catching and grilling some fishes become common activities there. Some lucky tourists can even join fishermen to go to the sea, catching the fishes. A trip to Mutus Island takes several checkpoints. 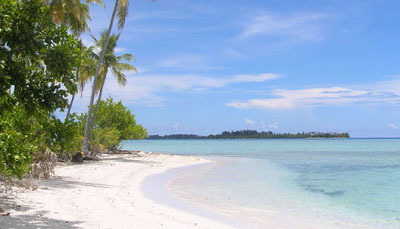 First, travelers need to head to Waisai City, which is the capital of Raja Ampat. For those coming from other provinces, an airplane is the best option for transportation. In this case, the destination is Marinda Airport. Next, they should head to Waisai Port and take a speedboat to reach Mutus Island. It won’t be a boring trip, as the sea scenery is mesmerizing!